Since beginning my journey on Who I Want To Be, I’ve spent a lot of time in reflection. I review myself, give myself criticism, praise myself, forgive myself, destress myself, relax myself…. seeing a trend? But this week my focus has been outside of my own self. My darling husband has been such a help since I’ve known him, and especially these past few weeks. I am so happy to spend my down time and vacations with him, but also to cook, clean, budget and manage the house with him. This week he not only assisted in our momentous cooking of tons of freezer meals, but he put some sweat and toil into a new craft project I’m working on. He’s always there to assist me in my endeavors, and he supports my crafts, my blog, and my creativity. I really can not thank him enough. This week I am overwhelmed with gratitude for my spouse. As I noted in my “Just Because” Candy post, I’ve given him little presents to show my appreciation. I enjoy giving him little tokens of gratitude like that, but this week I spent some time thinking about how I can better my husband as I am striving to better myself. By pure serendipity, this post by Time Warp Wife popped up in my Pinterest feed. I love all of her posts, but this one from 2011 really rang out to me this week. 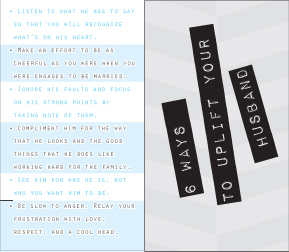 In her post, Darlene lists 6 things that women can do to “build up” our husbands. The items she mentions are small, every day things that will gain in momentum by repetition. The concept of meditating on these 6 items and remembering them seems daunting to me. I’m liable to forget anything that I’ve not written down. Moreover, even if I’ve written it down and tucked it away, I’ll cease to think of it until I pull it out again. 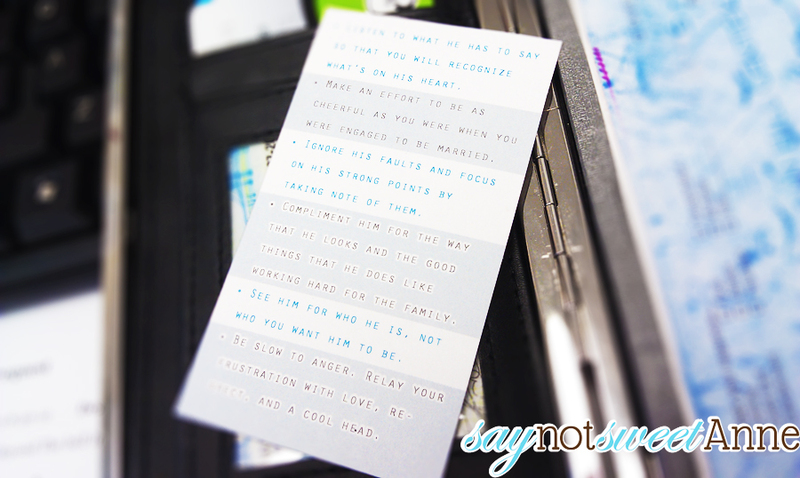 So, I made this little business card to print and keep around. My hope is that I will see this card in my wallet at least once a day, and remind myself that my husband deserves all of these things from me- and that I appreciate him. And, since you all know I wouldn’t make something without sharing it with you… here you go!